One of my frustrating missions in life is to educate policy makers on the Laffer Curve. This means teaching folks on the left that tax policy affects incentives to earn and report taxable income. As such, I try to explain, this means it is wrong to assume a simplistic linear relationship between tax rates and tax revenue. If you double tax rates, for instance, you won’t double tax revenue. But it also means teaching folks on the right that it is wildly wrong to claim that “all tax cuts pay for themselves” or that “tax increases always mean less revenue.” Those results occur in rare circumstances, but the real lesson of the Laffer Curve is that some types of tax policy changes will result in changes to taxable income, and those shifts in taxable income will partially offset the impact of changes in tax rates. However, even though both sides may need some education, it seems that the folks on the left are harder to teach – probably because the Laffer Curve is more of a threat to their core beliefs. If you explain to a conservative politician that a goofy tax cut (such as a new loophole to help housing) won’t boost the economy and that the static revenue estimate from the bureaucrats at the Joint Committee on Taxation is probably right, they usually understand. But liberal politicians get very agitated if you tell them that higher marginal tax rates on investors, entrepreneurs, and small business owners probably won’t generate much tax revenue because of incentives (and ability) to reduce taxable income. To be fair, though, some folks on the left are open to real-world evidence. And this IRS data from the 1980s is particularly effective at helping them understand the high cost of class-warfare taxation. 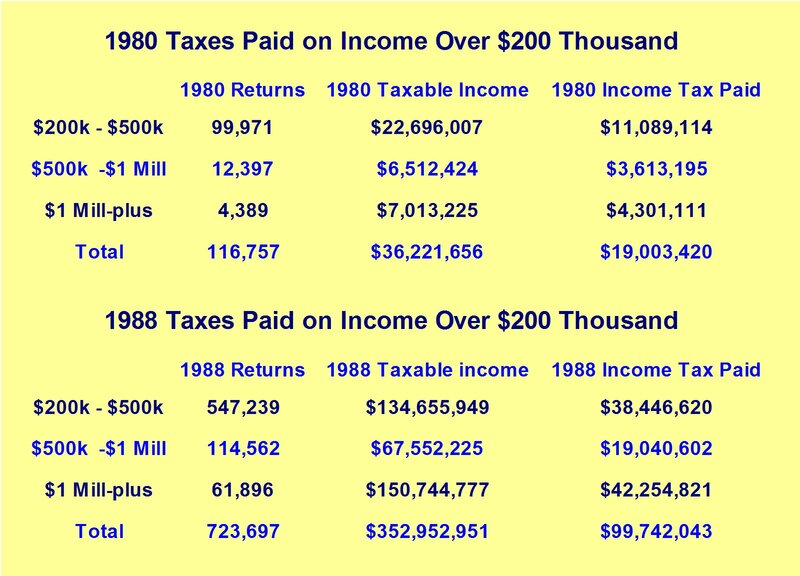 There’s lots of data here, but pay close attention to the columns on the right and see how much income tax was collected from the rich in 1980, when the top tax rate was 70 percent, and how much was collected from the rich in 1988, when the top tax rate was 28 percent. The key takeaway is that the IRS collected fives times as much income tax from the rich when the tax rate was far lower. This isn’t just an example of the Laffer Curve. It’s the Laffer Curve on steroids and it’s one of those rare examples of a tax cut paying for itself. Folks on the right, however, should be careful about over-interpreting this data. There were lots of factors that presumably helped generate these results, including inflation, population growth, and some of Reagan’s other policies. So we don’t know whether the lower tax rates on the rich caused revenues to double, triple, or quadruple. Ask five economists and you’ll get nine answers. But we do know that the rich paid much more when the tax rate was much lower. This is an important lesson because Obama wants to run this experiment in reverse. He hasn’t proposed to push the top tax rate up to 70 percent, thank goodness, but the combined effect of his class-warfare policies would mean a substantial increase in marginal tax rates. We don’t know the revenue-maximizing point of the Laffer Curve, but Obama seems determined to push tax rates so high that the government collects less revenue. Not that we should be surprised. During the 2008 campaign, he actually said he would like higher tax rates even if the government collected less revenue. That’s class warfare on steroids, and it definitely belong on the list of the worst things Obama has ever said. But I don’t care about the revenue-maximizing point of the Laffer Curve. Policy makers should set tax rates so we’re at the growth-maximizing level instead. To broaden the understanding of the Laffer Curve, share these three videos with your friends and colleagues. This first video explains the theory of the Laffer Curve. This second video reviews some of the real-world evidence. And this video exposes the biased an inaccurate “static scoring” of the Joint Committee on Taxation. And once we educate everybody about the Laffer Curve, we can then concentrate on teaching them about the equivalent relationship on the spending side of the fiscal ledger, the Rahn Curve. on November 21, 2017 at 10:19 pm Republican Tax Reform: Feast Today, Famine Tomorrow - Is It 2020 Yet? You write above: “Folks on the right, however, should be careful about over-interpreting this data. There were lots of factors that presumably helped generate these results, including inflation, population growth, and some of Reagan’s other policies. So WE DON’T KNOW whether the lower tax rates on the rich caused revenues to double, triple, or quadruple (emphasis added). Ask five economists and you’ll get nine answers. But we do know that the rich paid much more when the tax rate was much lower.” I really enjoy your articles and the videos you presented. Where I am at a loss is with why you’re advocating a theory when there is NO evidence that the theory exists? What do you have to say about the “experiment” going on in Kansas under Governor Brownback? As this sort of points out, the real question is where are we actually at on the laffer curve. Another point to ponder is at what point is public spending restricted to a point where research and infrastructure spending are reduced below where they are best for the future economy. If you are lowering taxes today but restricting the future potential of the economy is that worth it? Excuse me but your table makes no sense. in 1980 there were only 4,400 individuals who claimed income over $1M? And that number increased to 62,000 claiming income oveer $1M in 1988? Preposterous. Further, if 4400 people claimed income over $1M, how is it possible that income in this group was only $7M? If 4400 people claimed income over $1M, at the VERY LEAST, the total income should be $4,400,000,000. Yes, that is $4.4B. Or maybe it’s per capita. Maybe it was actually 4.4 million people who claimed income over $1M. Who can tell, this is so sloppily presented that even superficial analysis of it is impossible. Maybe this is why liberals economists don’t get the Laffer Curve. Either it makes no sense or you are incapable of explaining it. The Laffer curve as it applies to taxation is much more complex that the way it applies to a business trying to maximize revenue. First, you should completely understand the business application before applying it to taxation. @KYT Not just tax collected per return as a percentage but also on absolute terms. The average income in that group went from $932K in 1980 to over $2 million in 1988, but the average tax paid per return dropped from $155K to $132K. Interesting post but the liberals are going to rip you a new one (or should if they knew what they were doing) for comparing unadjusted 1980 and 1988 numbers. It really is apples and oranges. There were many more rich people in 1988, and your own chart shows the tax collected PER RETURN is lower. Not good. Just more data showing that the rich are shifting the burden of taxation to the middle class, under both Democrats and Republicans. Actually, I think I do understand the Laffer Curve. The same way I understood it before. What I don’t understand is the claimed effect that on taxable income, there seems to be none. In other words, as the tax rate drops; there is an inversely proportional INCREASE in the amount of tax revenue as a percentage of taxable income. Just what the Laffer Curve (as I had PREVIOUSLY understood it) predicts. 38.5 / 134.65 = 28.6% —- i.e., the 28% tax rate reported. 11.1 / 22.7 = 48.9% —– i.e., NOT the 70% tax rate reported. I don’t understand how the Laffer Curve or the amount of taxable income changes the rate of taxation OF that taxable income from 70% to 49%. The RATIO (or rate) of increase in taxable income to increase in tax paid was 1.71 ((5.93 / 3.47 = 1.71)); exactly the change in the tax rate. I don’t understand how the Laffer Curve works anymore. Sorry to come late to party. I’m not in favour of high taxes – largely because I’m not in favour of a large state – but I’m not convinced by the Laffer argument as put forward here. Laffer’s idea comes in two flavours, it seems to me. The soft version holds that high tax rates encourage the rich to hide income or otherwise avoid taxation, and that lowering tax rates while closing off loopholes, etc. can lead the rich to declare more income. That is undoubtedly sometimes true, and may be a partial explanation of what happened in the Reagan years. The hard version holds (1) that high taxes can suppress growth, (2) that lowering tax rates can stimulate sufficient extra growth to offset the lower rates, and (3) this is actually what happened in the United States in the Reagan period and after. Here’s real US GDP growth (5 yr averages) versus the marginal income tax rates, since 1970. There’s very little evidence for the Laffer thesis. For one thing, growth did not increase! There was an upward blip in the late 80s (after the first tax cuts), but a bigger increase in the 90s after Clinton raised the margin rate. Bush’s tax cuts produced nothing we can see in these statistics. The miserable truth is that growth has steadily fallen for decades, regardless of tax rates. I have my guesses on why this happened, and I don’t think Dr Laffer has much to contribute to the debate, although Dr Hayek certainly does. @truther: no. income is a negative function of tax rates. which is the reason why the laffer curve exists in the first place. Am I missing something here? According to the chart the IRS collected almost $100 mil in taxes in 1988, five times the $20 mil it collected in 1980, albeit at a much lower tax rate. But taxable income from “rich” people was 10 times greater in 1988 than 1980. Can’t it be argued that the IRS would have (should have?) collected $200 mil in revenue in 1988 had the rate stayed at 70%?????? There must be good examples other than the 1980 – 1988 comparison. The 1980 – 1988 comparison is a bit like comparing apples to oranges. The tax reform act of 1986 allowed for S-Corps, which led to a lot of income previously declared on corporate returns subsequently being declared (and taxed) on individual returns. Just that fact would account for a lot of the increase in individual tax payments. Liberals also ignore this fact: I’ve seen them argue that corporate taxes accounted for much more of a percent of GDP in 1970 or 1980 vs 1990 or 2000. So corporations must be taxed more!!! But again, much income that was “corporate” pre-1986 is “individual” post-1986. In discussing the Laffer curve nearly everyone ignores, the most important element: EFFECT ON ECONOMIC GROWTH. Given sufficient time the effect of lower economic growth under high tax rates overrides all other factors when it comes to tax revenue (…and also GDP… and also overall prosperity). So the Laffer curve CANNOT be presented or discussed without a time horizon. The Laffer curve looks different if we are talking about tax revenue tomorrow, in a year, five years or twenty years. This is because it takes some time for people to react to changes in taxation (including the changing of lifetime trajectories towards mediocrity – ex. deciding to not go to college, deciding not to join that startup etc. ), but PRIMARILY because it takes some time for the relentless effects of a compounding lower growth to affect GDP and thus also tax revenue. If tax revenue in year n is represented as Tn = TR * BGDP0 * (1+GR)^ n where TR is the tax rate, BGDP0 is baseline GDP in baseline year 0, GR is the annual growth rate, and n is the year, then, GR always becomes THE DOMINANT factor given a large enough n.
Always has a solution for n regardless of TRh,TRl so long as GRh<GRl i.e. so long as higher tax rates result in lower economic growth. That is why, the left, in order to also convince anyone who understands intuitive elementary arithmetic (? less than 20% of the population?) to acquiesce to higher tax rates, it must also sell the story that higher tax rates also result in higher growth rates. So the postulate that “all tax cuts pay for themselves” or that “tax increases always mean less revenue.” Is likely true if one adds “…after a sufficient number of years” or “… given a long enough time horizon”. Hence the problem of the suicidal 60% (American voters that is): “I’m in distress now [because my standard of living is sliding from the top 15% worldwide to 18% worldwide] therefore redistribute NOW, the future be damned, so I rest my Hope that Change to redistribution and central planning will lead to high economic growth and prosperity – I drink the cool aid of delusion for now and we’ll find something later that will propel us back to the top 10% of world prosperity”. Once you’re gone, once you’ve become France, you can’t come back. Absorption into the worldwide average will be your fate. People in the Democratic Western World want high tax rates because they want a large proportion of the economy to be collectively managed, it gives them control, and hope that they will be disproportionately recipients of tax revenue (at least what is left after waste fraud and abuse) rather than contributors to the inefficient pile.